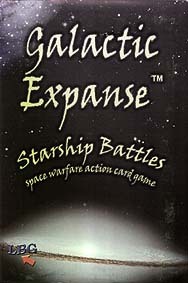 This is an exciting card game of strategy, tactics and chance in deep space combat between the warring space-faring humanoid species who all feel that the galaxy is not big enough for all of them. Their starships combine the awesome firepower of powerful particle accelerator beam energy weapons and devastating hyperspeed torpedoes for close combats and long-range raids by smaller ship-borne strike craft and the deadly mercenary shadowcraft. The four different species can ally in various patterns, resulting in different combinations in different games, or they can operate alone. Players determine when and where to seek battles; to launch distant raids or close with the enemy for battles within star systems or nebulae. The side that score the most victory points by vaporizing enemy ships and winning star systems wins the game. This is an entertaining and fun card game where every playing is different. Brean: They always try to operate their powerful starships under the "rule of three" to increase their power. Gar/Garsin: This is a matriarchal society that is most potent when a female "Queenship" is present with a fleet. Always aggressive, they have no patience for the veiling technology that can hide starships. Nizk: The absolute masters of robotics and automation, their powerful starships can produce awesome firepower. Sarn: An almost hypnotic art of the deal is their strong suit and they emphasize defense in battle so that all their ships carry veiling technology. A Bag of six dice and wooden game markers. The Complete Rules of Play: Comprehensive, all colour and richly illustrated.